Robert Mabe is a stellar banjo player, singer/songwriter, from the hills of North Carolina. As a young banjo player in North Carolina, Robert had the opportunity to learn from and perform with many great bluegrass and old time banjo players as the area was and still is a hot-bed of musicians. His unique style cover a wide range of music from straight ahead buegrass to jazz, irish, and roots music. Robert has been touring steadily for several years both in the US and abroad. 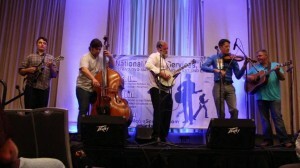 He has recorded and shared the stage with some of the greats in bluegrass music.